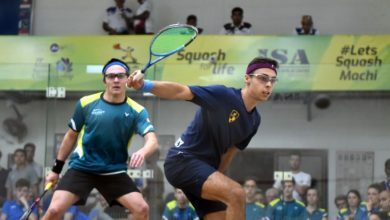 Upsets continued to play their part on day four of the WSF Men’s World Junior Team Squash Championship in India where Czech Republic and USA, the sixth and eighth seeds respectively, defied the seedings to claim surprise berths in the semi-finals of the biennial World Squash Federation event in Chennai. 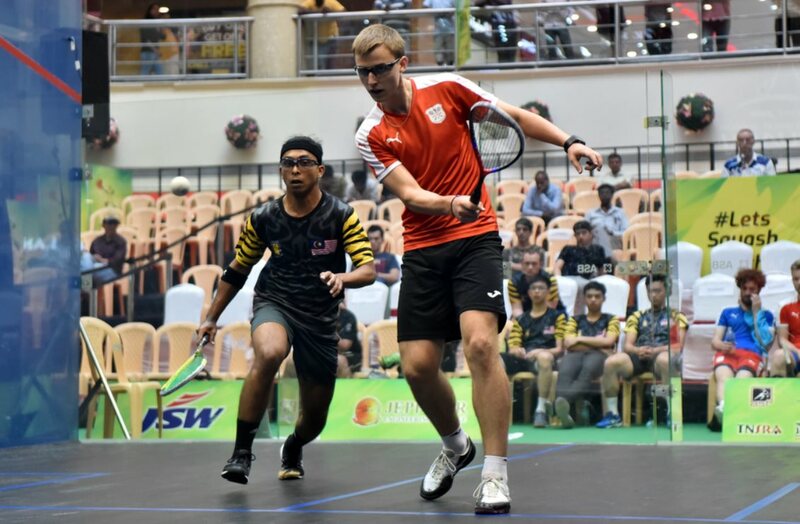 The Czechs – in only their second ever appearance in the championship and with a squad of players none of whom had competed in last week’s individual event – outshone fourth seeds Malaysia. Second string Ondrej Vorlicek put the underdogs ahead after 45 minutes with an 11-4, 12-10, 6-11, 11-2 win over Malaysian Siow Yee Xian. 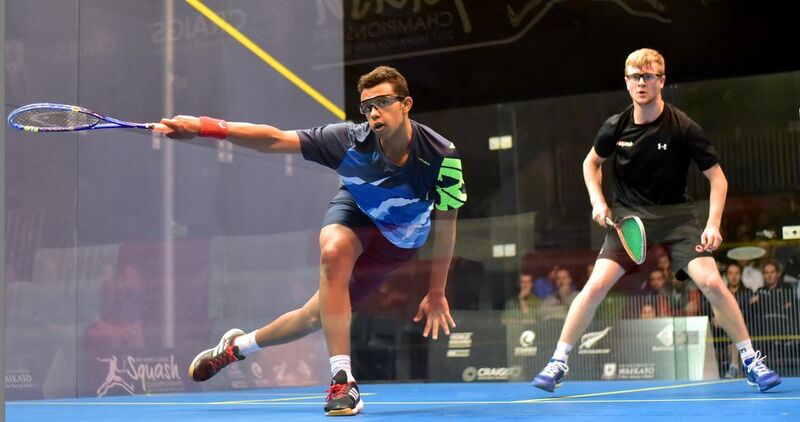 Top string Viktor Byrtus, a 17-year-old from Ostrava, sealed victory for the Czechs, fighting back from a game down to beat Darren Rahul Pragasam (both pictured in action above) 10-12, 11-9, 11-1, 11-6. Czech team manager Jan Mutina added: “It’s an amazing feeling to be in the semis! At the start of the tournament we wanted to confirm our seeding, yet we overachieved it, which makes us very proud and happy. Czech now face Egypt, the favourites who brushed aside Hong Kong China 3/0. 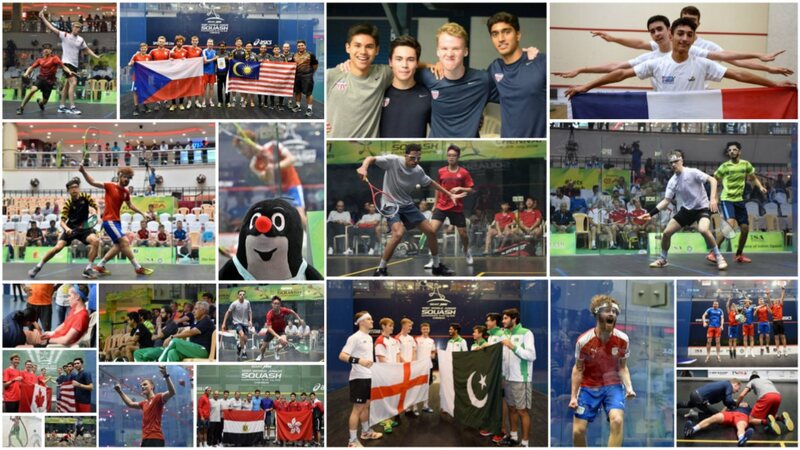 The final spot in the semis was claimed by USA after a tie of unbelievable drama at the Indian Squash Academy. The No.8 seeds faced North American rivals Canada, seeded two and expected to achieve their best ever finish. 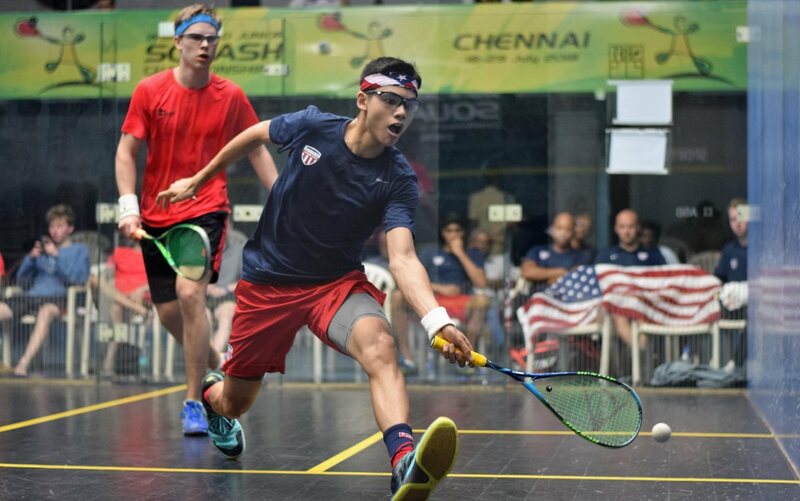 Tiber Worth got the USA off to a great start, taking the opening two games, only to see Canada’s James Flynn recover to put the underdogs ahead after an 8-11, 8-11, 11-2, 11-2, 11-6 win in 49 minutes. 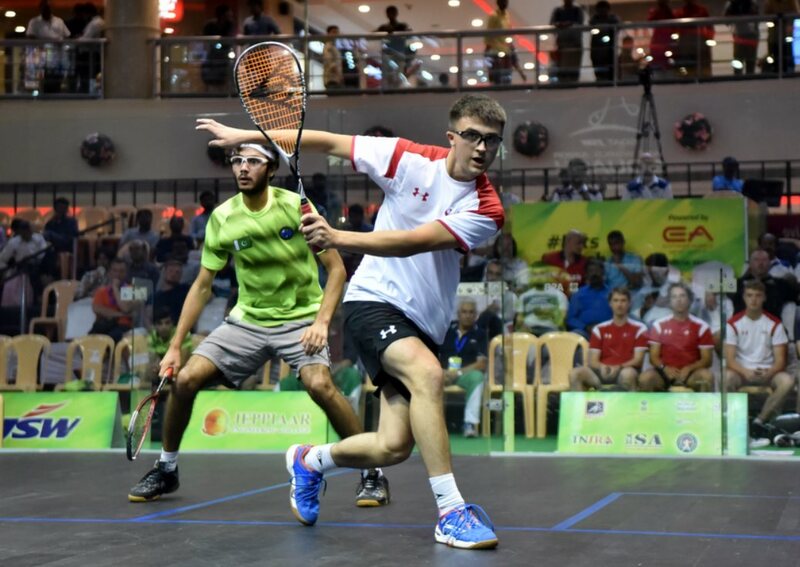 With the Canadian Julien Gosset leading 2/1 in the second match and with match-ball at 10-6, a semi-final berth for the No.2 seeds looked a certainty. But in stretching for a ball, 18-year-old Gosset slipped badly, clutching his hamstring. After treatment, he returned to court but was clearly unable to compete and at 11-10 down, was forced to concede the match to Daelum Mawji (pictured above en-route to victory). 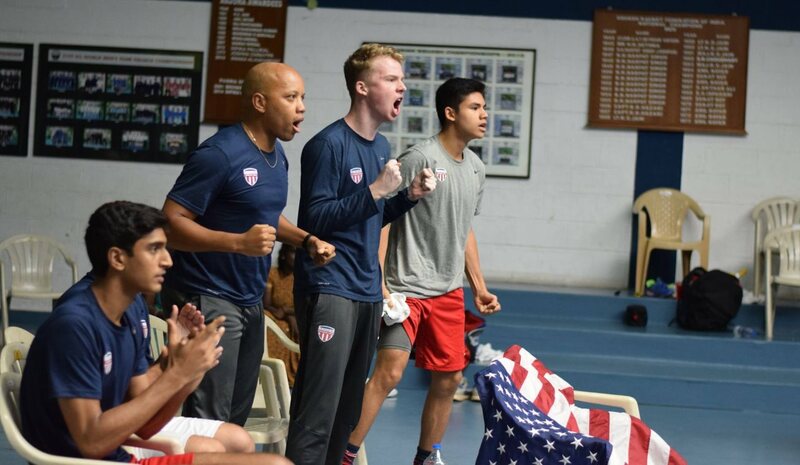 In the unexpected decider, it was USA’s Thomas Rosini who triumphed 11-9, 1-11, 11-5, 12-10 over George Crowne to clinch the semi-final berth for USA – much to the sheer delight of his team-mates! US Coach Simba Muhwati had mixed emotions: “Our hearts go out to Julien, he’d played an amazing match before that injury. “The emotions involved from Tiber being two-nil up and losing, from Daelum being match ball down and winning, and then Thomas playing so well to put us into the semis! USA now face England for a place in the final after the third seeds defeated defending champions Pakistan 2/1. 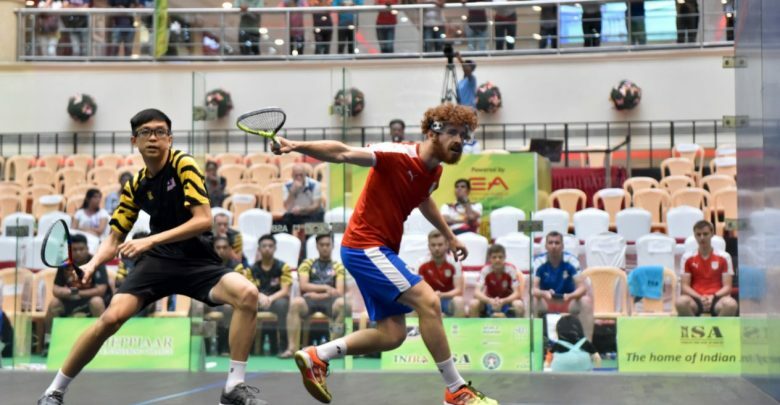 Yorkshireman Nick Wall clinched victory for the former champions when he beat the Pakistan No.1 Abbas Zeb(both pictured below) 11-9, 11-6, 7-11, 11-6. “It’s great to be in the semis,” said England coach Lee Drew. “Pakistan put up a great fight as you’d expect – they would have picked up a lot from last night’s win here over India.